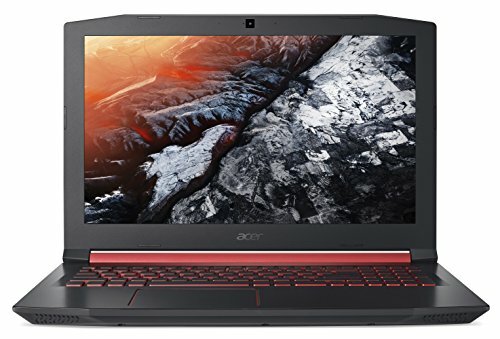 Acer’s Nitro 5 gaming laptop says you can have a modest budget of $800 or less and get a decent amount of horsepower for playing AAA games. While most of the Nitro 5’s parts are midrange at best, it takes things up a notch with its new Coffee Lake CPU, offering solid mobile gaming performance in an affordable, if somewhat hefty package. While the Nitro 5’s Coffee Lake Core i5 CPU qualifies as cutting-edge, its GTX 1050 graphics card—while by no means a slouch—sits near the bottom of Nvidia’s GeForce 10 Series line. As we’ll see in a bit, that means crushing gamers’ dreams of silky-smooth frame rates at Ultra settings. Still, bargain hunters who can live with something closer to 30 fps can crank up their graphics settings all the way. See our story on how to choose a gaming laptop GPU to learn more about choosing this essential part. There’s some good news if your budget can stretch a bit more, too. For about $100 more, you can step up to a model (specifically, the AN515-51-55WL) with GTX 1050 Ti graphics and a 256GB solid-state drive, plus a 2.5-inch bracket, a SATA cable, and enough screws to install a second drive. Nothing against the budget model we’ve tested, but as you’ll see in our performance section, moving up to a GTX 1050 Ti would make a noticeable difference in the Nitro 5’s gaming prowess. There’s nothing small about Acer’s Nitro 5 budget gaming laptops, and this new Coffee Lake version is no exception. Measuring a fairly bulky 15.4 x 10.5 x 1 inches and tilting the scales at a hefty 5.4 pounds, the Nitro 5 barely squeezes into my 15-inch laptop backpack. It’s as heavy as it looks, too, although, to be fair, that’s more in comparison to a mainstream laptop than to a gaming laptop, where hefty is the norm. Pack in the charging cord and power brick (and yes, you’ll need them, given the Nitro 5’s relatively meager battery life), and you’ll wind up with a more than 6.5 pounds of hardware to lug around. Hulking though it is, the Nitro 5 manages to look reasonably sleek thanks to the brushed finish on its lid, its crimson hinge and matching backlit keyboard, complete with highlighted WASD keys. While it’s quite an eye-catcher compared to business-minded laptops, the Nitro 5 is actually a bit low-key as far as gaming laptops go. Flip the Nitro 5 on its back and you’ll find a pair of removable panels. One is for the drive bay (there’s room for only one drive, meaning you’ll have to replace the existing drive to upgrade your storage), and a second for upgrading the RAM. You can open each panel by loosening a single screw and pulling on a thumb tab. The Nitro 5’s 15.6-inch, 1920×1080-pixel display looks relatively sharp and vivid given the laptop’s budget price. Measuring just 251 nits (or calendas), the non-touch display is somewhat dim, just barely exceeding our minimum standard for comfortable indoor viewing. In other words, good luck making out the action if you’re gaming near a bright window or outdoors. Viewing angles on the Nitro 5’s IPS panel were fine, if not particularly awe-inspiring. There’s no evidence of inverted colors when viewing the matted display from extreme angles, as we’ve seen on some cheaper laptops. That said, the screen dims noticeably when viewed from the side, starting at about 50 degrees or so. Looking from above or below, the screen is at its dimmest when viewed from about 45 degrees, before brightening a tad as we edge closer to 90 degrees. The trackpad centers under the letter section of the keyboard (there’s a numeric keypad to the right). The keys are backlit. 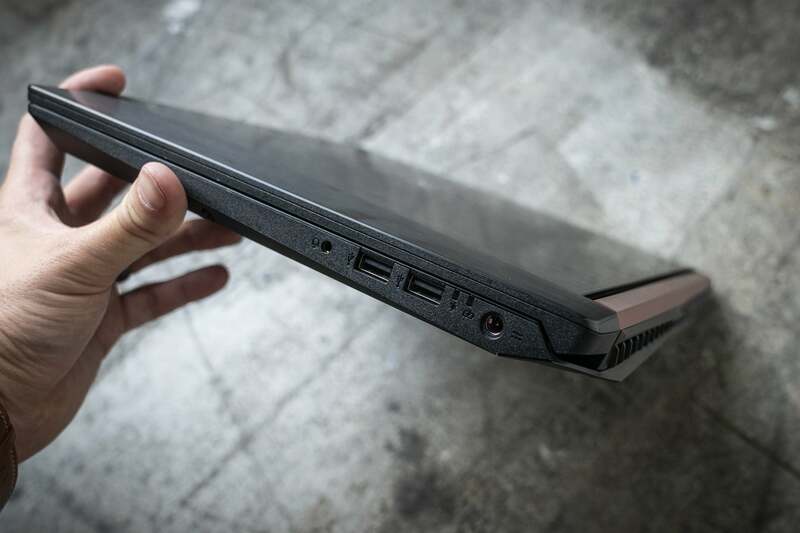 The Nitro 5’s built-in speakers are surprisingly good for a budget gaming laptop, boasting relatively robust, dynamic sound—nothing a set of dedicated speakers couldn’t do better, mind you, but not bad compared to the tinny audio you commonly get from laptop speakers. My usual test tracks, including “Live and Let Die” by Paul McCartney and Wings, along with Mozart’s Symphony No. 26, sounded detailed and roomy, with a slight hint of bass. I was also pleased by the delicate crunch of snow and ambient forest sounds in Rise of the Tomb Raider, as well as the glorious cacophony of exploding demons in Diablo 3. You can sweeten the audio with Dolby sound processing as well as crank up the volume to impressively loud levels, handy for drowning out the Nitro 5’s roaring fans. The Nitro 5’s 720p webcam videos look expectedly soft and grainy, but it’s still serviceable for video chat. The Nitro 5’s left side includes USB-C, HDMI, USB-A, and an SD card slot. The Nitro 5’s right side includes two more USB-A, an audio jack, and the charger port. 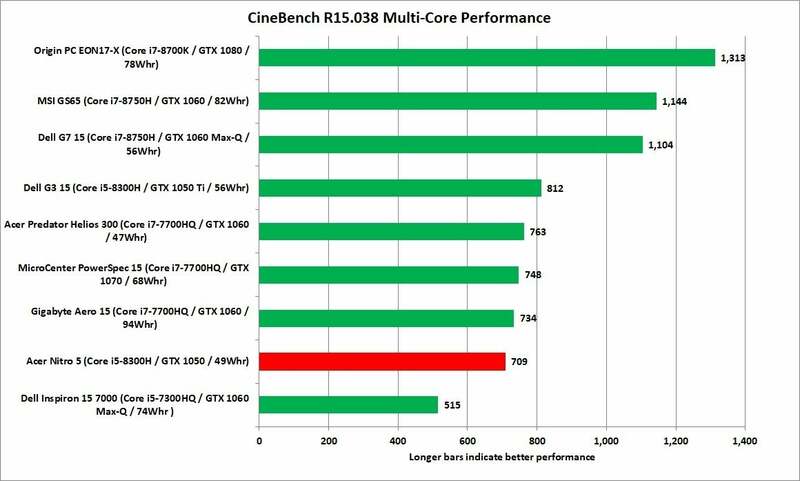 We start with Maxon’s Cinebench, which tests a CPU’s raw power—and the more threads, the better. Here’s a chance for the Nitro 5’s 4-core, 8-thread i5 Coffee Lake processor to shine. 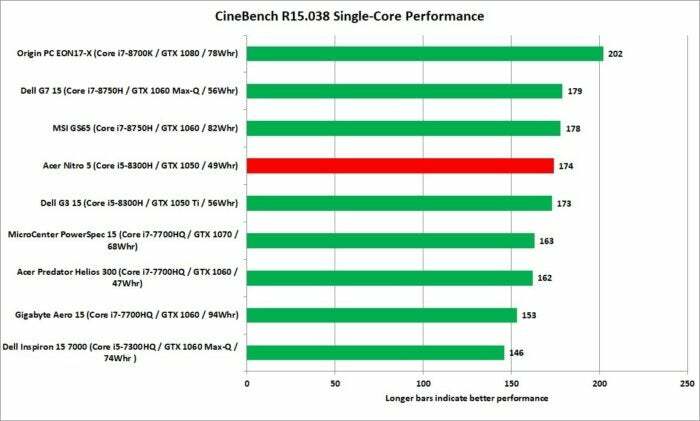 In the single-threaded test, it jumps right into the mix with Core i7 CPUs and easily bests pre-Coffee Lake Core i5 chips. 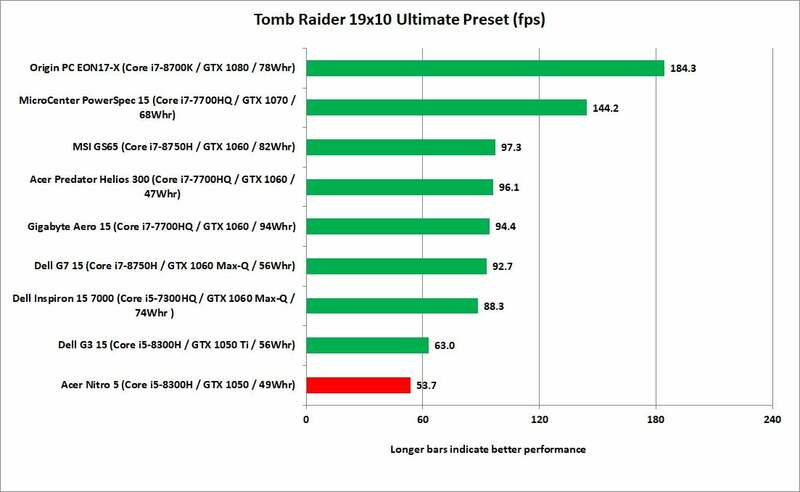 This is a good indication that it’ll perform just fine on most mainstream applications and games. Acer’s Nitro 5 fares well on the Cinebench single-threaded CPU test. The story changes when we run Cinebench in multi-threaded mode. 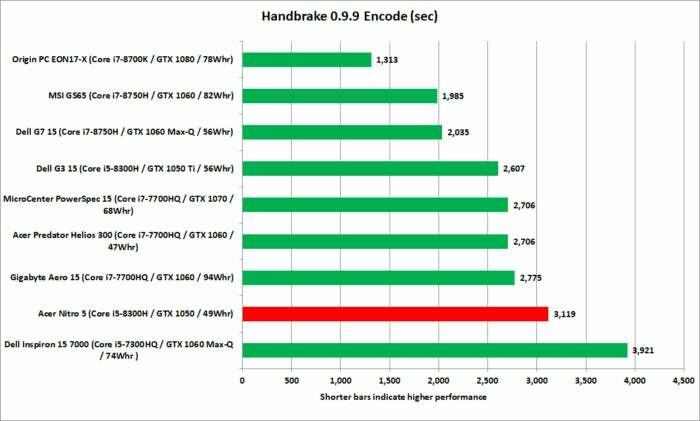 The laptops with 6-core, 12-thread CPUs get to strut their stuff, leaving all the quad-core chips jostling for second place. The Acer Nitro 5 lags behind its peers, with only a 7th-gen Core i5 laptop bringing up the rear. Just remember that there still aren’t many applications that support multi-threaded CPUs, so the score here doesn’t affect how most people will experience the Nitro 5. Acer’s Nitro 5 brings up the rear among quad-core CPUs in this multi-threaded test. The three leading laptops all have 6-core, 12-thread CPUs. 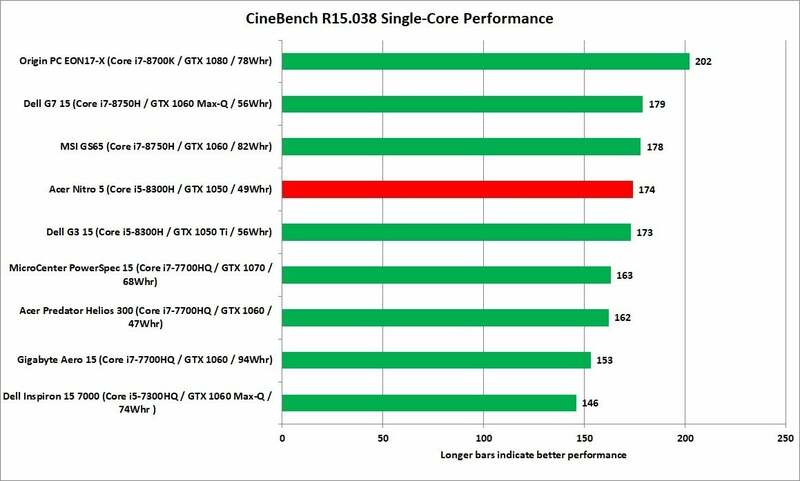 After Cinebench’s sprint, we send the CPUs on a marathon. The free HandBrake utility lets us measure how well the CPU performs over time with the intensive task of converting a 40GB video file into Android tablet format. The Acer Nitro 5’s gaming performance is dictated by its lower-end Nvidia GeForce GTX 1050 graphics card, and its benchmark results fell right in line with our expectations. In short, while the Nitro 5 delivers frame rates comfortably north of 30 fps at “Ultra” settings for typical AAA games, you’ll need to downshift your graphics settings to boost those frame rates into the 60-fps range. 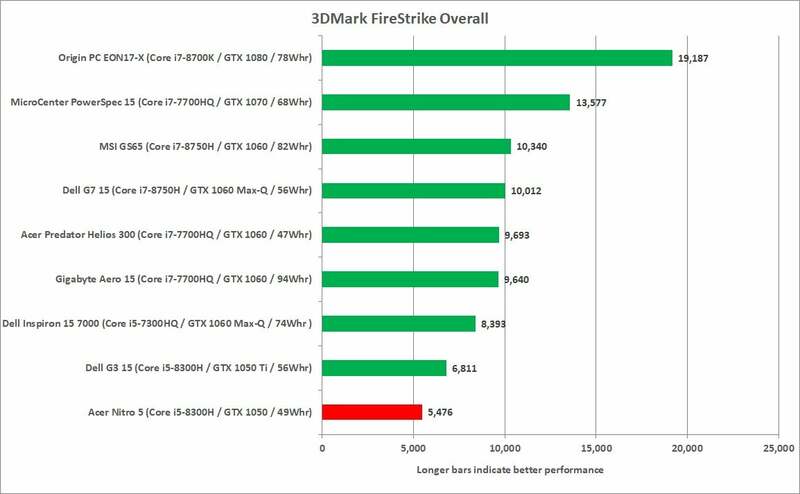 3DMark’s Fire Strike Extreme is a synthetic benchmark that focuses on pure GPU performance. The Nitro 5’s score of 5,476 is actually decent. 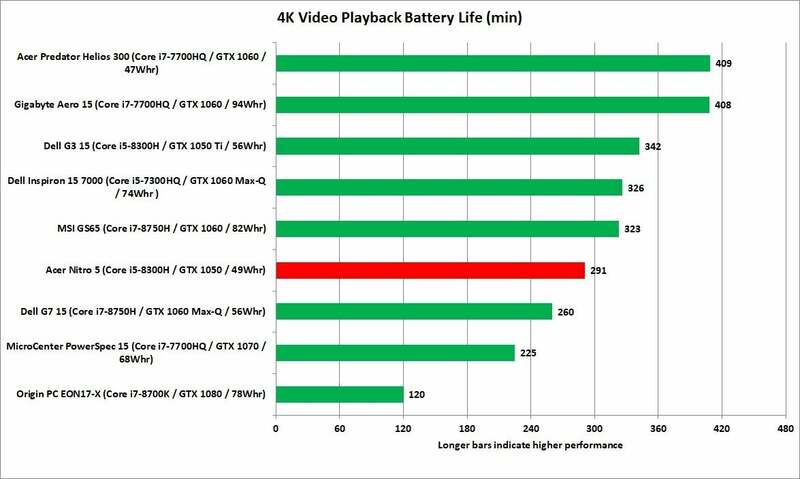 The reason it’s at the bottom of this chart, is because every other laptop shown has a GTX 1050 Ti or better. 3DMark FireStrike shows what a difference a GPU makes. The Acer Nitro 5’s GTX 1050 is competent, but if you want max settings you’ll need to dial back the frame rate. We’re not trying to make the Nitro 5 look bad. Compared to other GTX 1050 laptops, like the i7-7700HQ-powered Dell XPS 15, the Nitro 5 ends up looking pretty good. 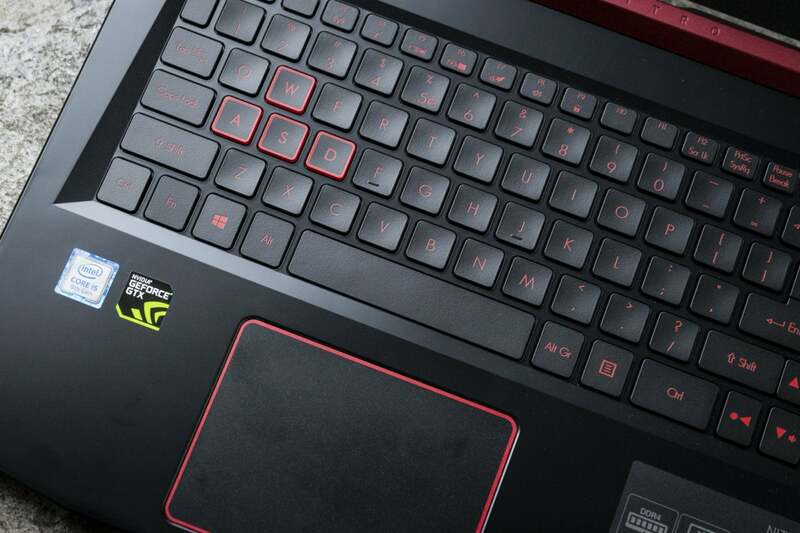 We’re just showing the trade-off of going with a lower-end GPU in a bargain gaming laptop. Moving on to some actual games, we first tested the Acer Nitro 5 with the oldie-but-goodie Tomb Raider at its Ultimate graphics preset, with the display set at 1920×1080 (and V-Sync off). 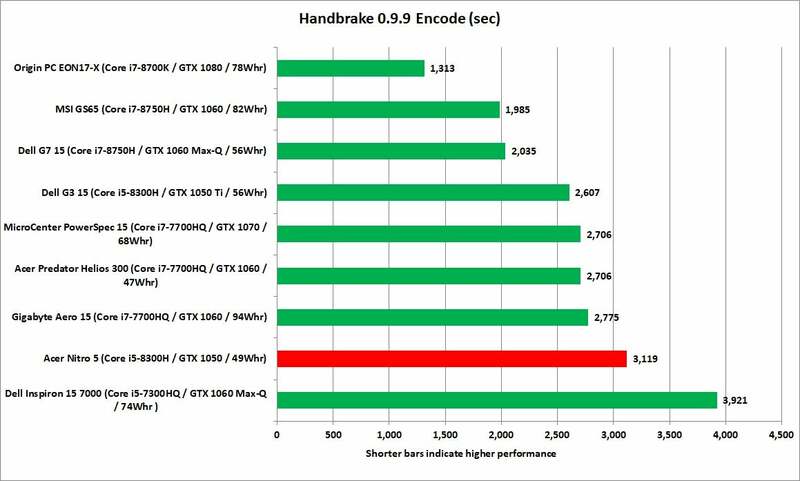 The Nitro 5’s GPU may be at the bottom of this chart, but that’s still logging a very good 53.7 frames per second. Now for something a little harder: Middle-earth: Shadow of Mordor at 1920×1080 and Ultra settings. The Acer Nitro 5 struggles a bit more, managing 47 fps and again bringing up the rear compared to laptops with huskier GPUs. 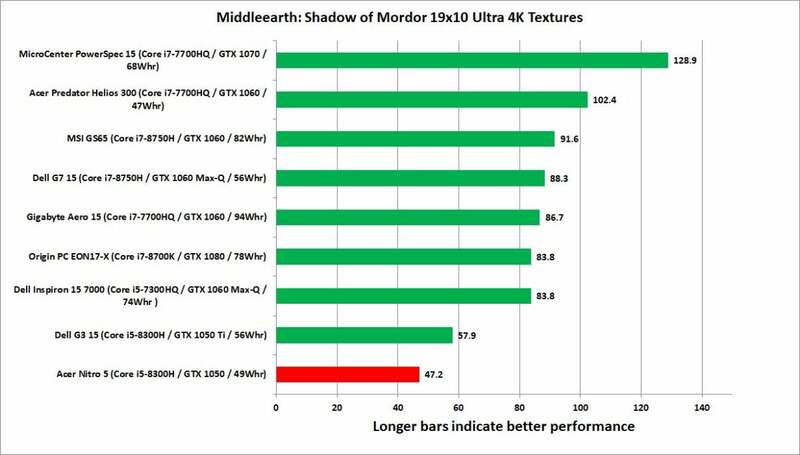 Acer Nitro 5’s 47 fps in Middle-earth:Shadow of Mordor is a decent score. That’s still solid gaming performance from a budget gaming laptop, albeit shy of 60-fps nirvana. For those craving buttery visuals on the Nitro 5, a little optimization through the GeForce Experience app managed to do the trick with just a few minimal compromises. 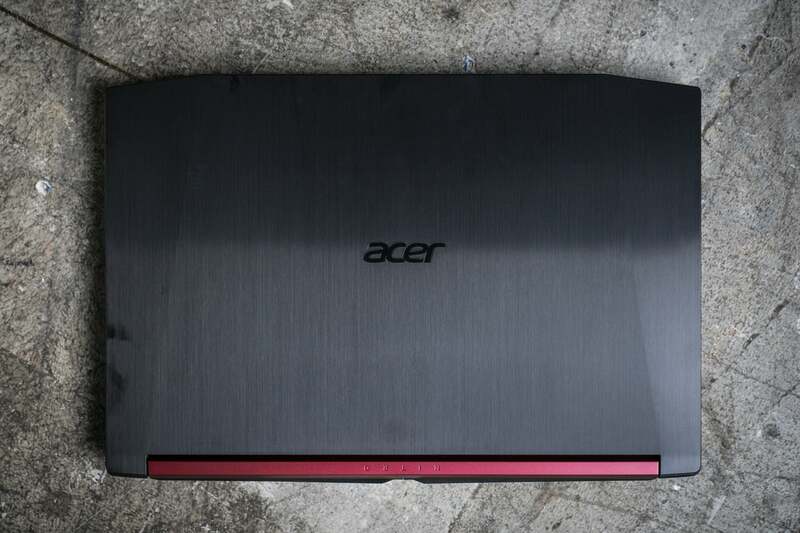 You can’t expect all-day battery life from a gaming laptop, and while the Acer Nitro 5 is no exception, we’ve seen much worse. The Acer Nitro 5’s battery life is about what you’d expect for a gaming laptop. The result: about 291 minutes, or just under five hours. That’s not too shabby given the Nitro 5’s gaming focus and its middling 48Whr battery. Indeed, we’ve seen gaming laptops with larger batteries that could barely make it past the 90-minute mark. Nevertheless, you won’t want to forget the Nitro 5’s hefty power brick if you’re taking it beyond your family room. 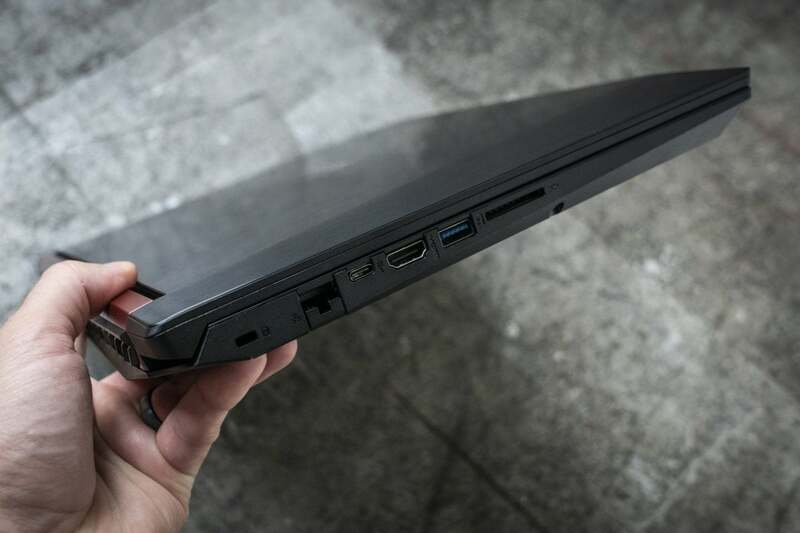 Budget gaming laptops don’t get as much of a break as their mainstream cousins. They still face intense pressure to deliver. The Acer Nitro 5 is big and heavy, with so-so battery life and a fairly dim screen. But if you’re shopping for a gaming laptop that can handle AAA titles without breaking the bank, the Acer Nitro 5 delivers the goods.